In what continues to be a cycle of wealth, a recent real estate survey found that young adults who had financial help from their parents during college are more likely to become wealthy themselves. The average student in the United States has about $26,000 in student loan debt upon graduation. This constitutes more than $280 per month in loan payments, on salaries often much less than $50,000 per year, which is the national average. Meanwhile, research indicates that people still want to own homes. Although it seems like an archaic way to build wealth for many recent graduates, owning property is still the main source of wealth acquisition for people in the United States. 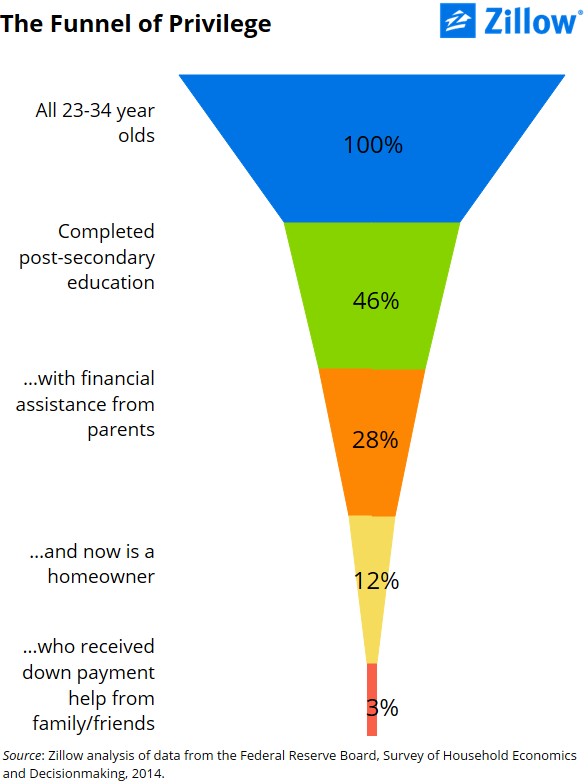 And believe it or not, there are recent college graduates who are already on the way to owning a house. The real estate research company Zillow found that at the beginning of this year, 5.3 million renters said they would be interested in buying a home. Many young adults cannot afford to put a down payment on a home, let alone consider looking for one. Those who can, however, are on a faster track due to the financial help they received during their education. In San Francisco, for example, it would take approximately 30 years for a person with a college degree and student loan debt to save up for a down payment. These numbers indicate that once someone is born into their privilege, they will have an advantage over those who received the same education without financial help, even much after college is over.